Today is Veterans Day. A day we celebrate the brave men and women who serve our country, I hope you'll take some time this week to practice an act of gratitude, as simple as saying Thank You, or something more substantial. 7 Ways to Honor a Vet : "Learn more. For many veterans, the most powerful thanks you can give is to simply understand why they served and what this nation is really all about. Spend some time learning about the details of American history, our proudest achievements and the great challenges facing us today. Remember also that our veterans did not serve to protect just part of America, but all of America, with all the freedoms that entails. Spend some time learning more about the parts of America you don’t know and about American beliefs that you don’t fully understand. In other words, become the best possible citizen you can be." 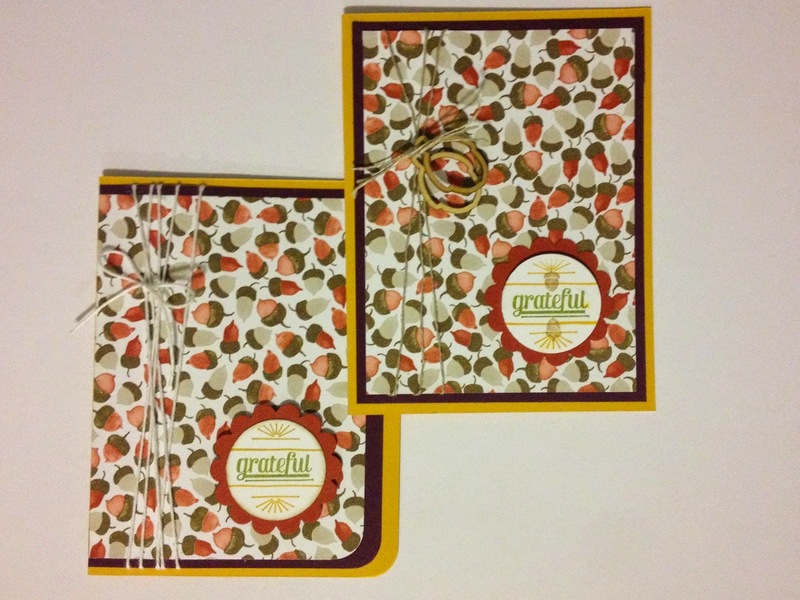 Today's cards use the Grateful sentiment from the Gratitude for Days stamp set. This is a photo polymer set, so layering the accents and sentiments is easy-peasy!! I used the acorn print. 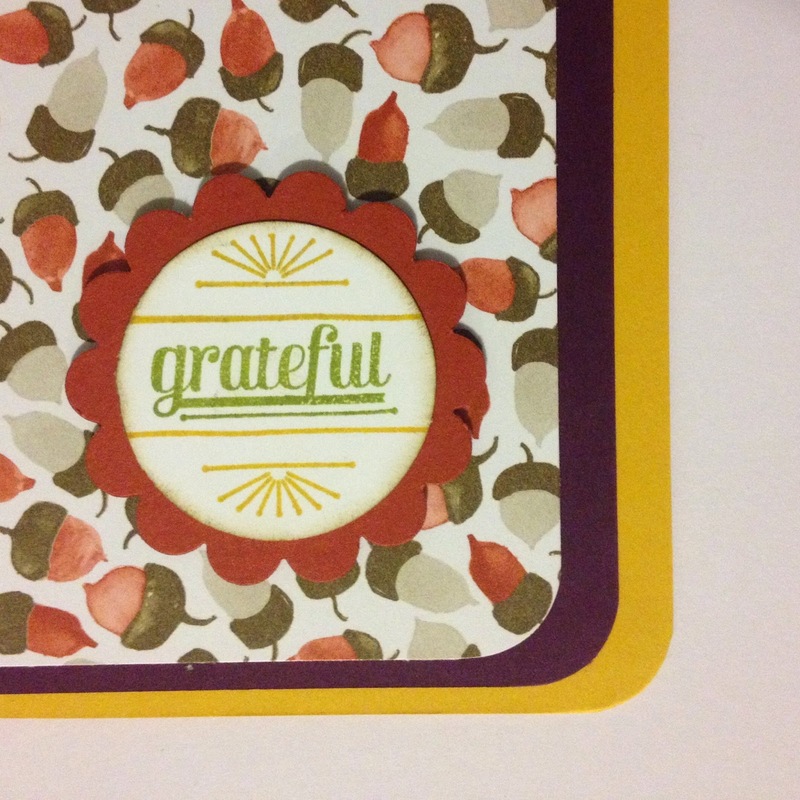 I really cant come up with a subtle way to use this print, so I went all out and used it as a background. I stuck with the color palate of the Designer Series Paper and used a Crushed Curry card base, and Blackberry Bliss layer behind the paper. 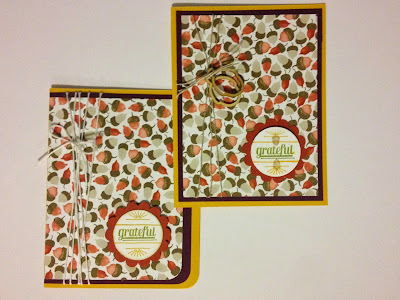 The sentiments from the Gratitude for Days stamp set are both done in Old Olive, with some of the accent stamps added in Crushed Curry, and layered over a Cajun Craze Scallop Circle Punch. 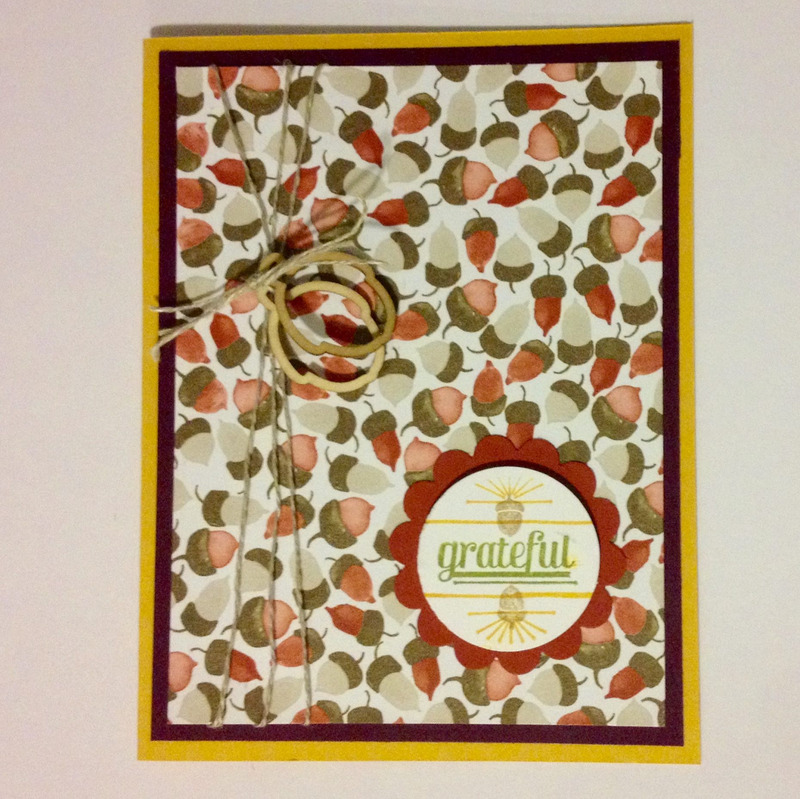 On the first card, the trim accent on the left is done in Whisper White Bakers Twine. The Grateful stamp has only the yellow accents, and I sponged some Soft Suede on the edges of the circle. 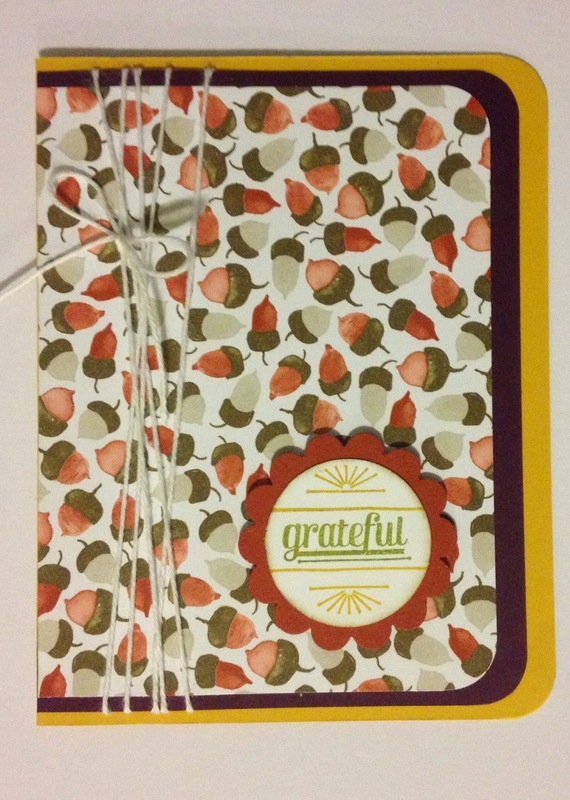 On the second card, I used Linen Thread, with the acorn pieces from the Autumn Wooden Elements. 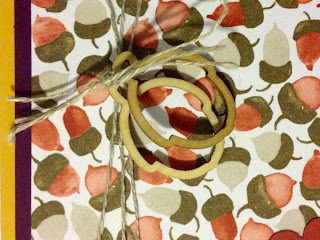 I added the acorn to the sentiment as well, in Soft Suede. You can see in this close up of the wood elements, I left them as they come, but you could step them up with some embossing or even just a little colored ink sponged on. 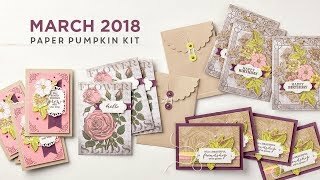 I'm using the same stamp set, layout, and Designer Series Paper this week. 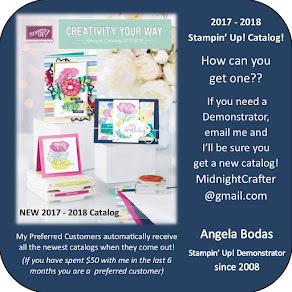 Lets see if I can inspire you all week! Veterans, and their families, are an inspiration every day! Please take a moment today to celebrate them.